The global automotive aftermarket is undergoing a massive transformation. Some of the key disruptors picked up the pace in 2018 and will continue to change supply-and-demand dynamics in 2019 and beyond. The interactive briefing will highlight short-term market shifts (e.g., opportunities for OEMs as new vehicle sales slow down and countries that will surge ahead in an uncertain global economy) as well as medium- and long-term trends, such as uberization of service and impact of ADAS. • Gain insight into digital channel participants that will influence the aftermarket supply chain, impacting profit margins for suppliers. • Better understand how Brexit could create an opportunity for suppliers from outside the EU to invest in developing supply agreements to the UK market. • Learn about investments from aftermarket participants will become more prominent in 2019 to leverage business opportunities from vehicle data over the long term. As the connected car market matures, there are opportunities for OEMs and start-ups to expand their capabilities and address challenges such as communication issues, providing personalized services, safety, and security inside the car. Frost & Sullivan invites you to join Krishna Jayaraman, Program Manager, Niranjan Manohar, Research Manager and Raj Paul, Regional Industry Business Leader, Microsoft, as they discuss an overview of the current and future market trends for connected cars and auto-IT, use cases to help understand the growth areas and new business models that automakers and technology providers can leverage . • What were the key product and technology trends that OEMs adopted in 2018? • What is the status of the different features offered by OEMs – uptake rate and comparative analysis of OEMs offering these features across different regions? This interactive briefing will provide an overview of the current state of electric vehicles (EVs) and discuss technology overviews, industry trends, key drivers, and opportunities for growth. 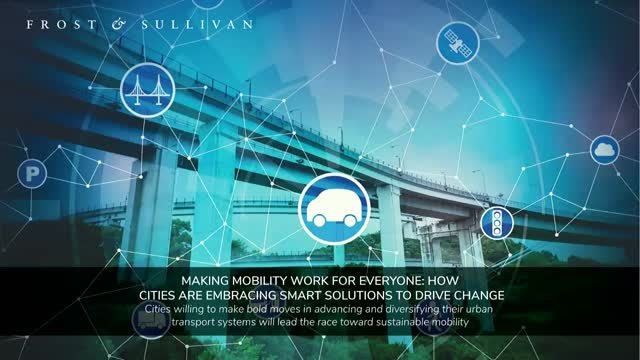 Join Frost & Sullivan's Mobility experts, Mark Fitzgerald, Anjan Kumar, Kevin Kelly, for the webinar: Electric Vehicle Outlook: Trends and Opportunities, followed by an interactive, live question-and-answer session. Join Frost & Sullivan's Mobility experts, Sarwant Singh, Franck Leveque, Mark Fitzgerald, as they provide a strategic outlook for 2019 and explain the predominant challenges that could hinder market growth. In the digital age, the existence of dealerships is threatened as car buying migrates to online platforms and smaller boutique stores. However, vehicle subscriptions offer an opportunity for dealerships and new entrants to add value to their archaic business models. Vehicle subscriptions offer a new form of temporary car ownership with the flexibility and convenience to switch programs, swap vehicles, and have no or low down payments, no penalties and a worry-free ownership experience. Regional truck sales are mainly cyclical and closely linked to economic growth rates, so OEMs and technology companies are steadily building new revenue streams. Growing regulatory and societal push for zero emission, zero accident vehicles is resulting in global truck and bus OEMs gradually investing in full electric powertrain architectures as well as deploying autonomous driving technology. The focus on these technologies by conventional manufacturers is further fueled by product developments from start-ups and technology companies. But how commercially ready are these technologies? What innovations are they encouraging? · Learn the technological preparedness of electric powertrain and autonomous driving ecosystems. · Identify new opportunities and technology providers in trucking. · Find out how truck OEMs plan to meet the demand for electric self-driven trucks. The global automotive aftermarket is undergoing a massive transformation. Some of the significant disruptors picked up the pace in 2017 and will continue to change supply and demand dynamics in 2018 and beyond. The briefing will highlight some of these short-term market shifts (e.g., North America will lag in aftermarket growth in 2018 while India and Latin America will see sharp upticks) as well as medium- and long-term trends such as digital B2B. · Understand the main factors that will influence the size of the global automotive aftermarket. · Discover the emerging regions served, or underserved, by automotive parts and services suppliers. · Participate in an interactive question-and-answer session with Frost & Sullivan experts. Globally, OEMs must capitalize on the inclination toward complete digitization as this will have a significant impact on the evolution of the transport and logistics industry post-2018. Trucks are operating in a complex environment, and accurate and timely information about weather, traffic, and other real-time intelligence is crucial for data-driven smart city initiatives. As the trucking industry moves closer to complete connectivity and autonomous technology, data privacy and cybersecurity will continues to gain higher in priority. Data may be a company's ultimate valued asset, but few are maximizing its economic benefit. Equipped with data, new companies are disrupting established industries, and traditional businesses are transforming the way they operate. Not all organizations are equally skilled at translating data into currencies, but their caliber to do so is impacting their ability to compete. Self-learning artificial intelligence (AI) in cars is anticipated to be one of the most extensive disruptions in the automotive industry. The technology is the key to unlocking fully autonomous cars and enhancing value for end users by enabling OEMs to diversify from a product focus to service focus. Frost & Sullivan recognizes four levels of evolution between 2016 and 2025 that would lead to various use-case scenarios on which industry participants can capitalize. Nevertheless, the market potential has attracted technology companies to participate in AI development, which, in turn, will lead to the disruption in the automotive industry value chain. · Understand the self-learning car roadmap to reformulate the product planning strategy. · Explore the technology focus and its applications to prepare for the transformation in the industry. · Learn more about the involvement of technology companies in the development of cars and how automakers are cooperating with them. Join Frost & Sullivan's Mobility experts as they provide a strategic outlook for 2018 and explain the predominant challenges that could hinder market growth. • Learn how flying car taxis could transform our world and the commercial applications predicted by 2035. • Explore technologic advancements as vertical take-off and landing (VTOL), artificial intelligence, HD mapping and electrification the opportunities they present. • Hear real-world use cases on how flying car companies have conducted test flights and the results of those ventures. The Frost & Sullivan Mobility practice provides global market intelligence, prescriptive research, and advisory services tailored to your organization. Our experience and global experts continue to adapt and innovate to identify opportunities and challenges to meet the ever-changing demands of the industry. Our Analyst briefings are a key insight into some of the advanced analytical tools to address converging mega trends, new business models, technology led solutions, regulatory changes and competitive pressures across a broad spectrum of industry topics.